A unique system turns moose killed in collisions into meals. Alaska’s road system was apparently not made with moose in mind. High-speed corridors run through prime moose habitat. Long stretches of speedway are poorly lit. Yet both moose and humans tend to commute on them in dark or dusky hours. In a state with about 200,000 massive, felt-horned ungulates roaming about, this is all but an invitation for relatively frequent and brutal crashes—up to 4,000 pounds of metal slamming into about 1,000 pounds of flesh, often at 65 miles per hour or more, which makes most deer strikes look like gentle fender benders. 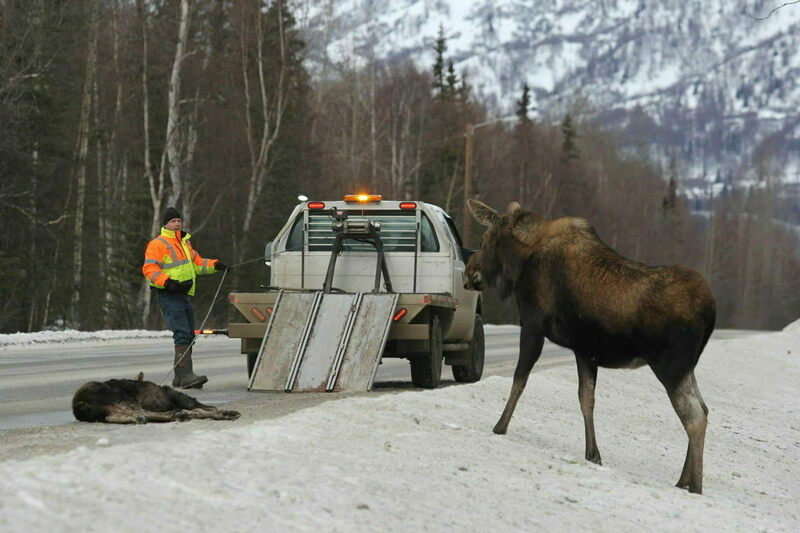 Even as Alaska works to improve road lighting, clear encroaching brush for visibility, and install one-way gates that funnel moose off the roads, wildlife experts estimate that 800 to 1,000 moose die in “vehicular interactions” every year. Moose strikes are so common in some areas that Del Frate has heard of locals devising bumper guard systems that allow them to smash into a beast and drive away with minimal damage to their vehicles. Then you’ve got a lesser number of deer strikes in the southeast, says Tony Kavalok, a Division of Wildlife Conservation worker since 2002. And the occasional bear, mountain goat, or caribou strike in other climes. That’s, conservatively, over a million pounds of rotting animal scattered across the state, blocking roadways and attracting scavengers. Dealing with this sheer mass of roadkill would be time-consuming and difficult in any circumstance. “Moose aren’t always easy to get off the road,” stresses Kavalok, “especially if it’s a big cow.” It’s especially burdensome in massive and sparsely populated Alaska. But in the ‘70s, Alaska developed a clever system to turn this burden into a boon: The state created a roadkill salvage program. In this system, the state contacts citizens and charities every time a trooper finds or is alerted to a big animal dead on the road. Soon thereafter, these groups and individuals swoop in, spirit the corpses away, and turn them into hundreds of thousands of pounds of edible meat every year. In theory, this lean red flesh is as versatile as beef, but it’s typically hacked into stew chuck or ground down for use in burgers and sausages. Game meats, which are wiry to start with and ever tougher with age, benefit from being being broken up and mixed with their own fat. That’s especially true for moose. Though it’s not sold in supermarkets, moose is widely coveted and consumed in Alaska, with local hunters harvesting and divvying up millions of pounds of flesh every year. And even one good animal can feed one man for about a year. “Everybody sees the value in 200 to 400 pounds of high-quality, edible meat,” says Del Frate. Especially in a state with high (and rising) food insecurity, no one wants to waste that resource. No one I’ve spoken to could pin down precisely when Alaska’s salvage system started up, but it was operational by the late ‘70s. It was put under the auspices of the state troopers, which, in Alaska, includes wildlife officers. Troopers are usually the first responders at crash sites throughout Alaska, and the state technically requires drivers who encounter unattended roadkill to report it to them. Legally, roadside big game is Alaska state property. The troopers maintain regional lists of individuals and organizations who apply for access to these kills. Generally, the lists in urban areas feature more charities run by churches, while remote areas’ lists include more individuals and families who need the meat. In most regions, anyone can just file the paperwork and get on the list. Whenever troopers find a moose or other big game, they report it to their dispatchers, who make calls to find the first person or group in the area able to immediately salvage it. That usually means driving out with a flatbed truck and hauling up the whole carcass, ideally with a winch. Once safely back at a Church or home, helpers deconstruct the game. This system ensures that the most meat possible makes it into the food system rather than the landfill. As Linnekin notes, people have been salvaging furry car victims all over the United States for ages, especially in rural areas. The practice is only expressly illegal in a couple states, such as California and Texas, apparently on public safety grounds. Some state agencies have historically made ad-hoc roadkill donations to charities, even without formal programs. So it’s only natural that many other states have developed salvage systems—often in response to waste concerns and as efforts to reduce food insecurity. I’ve found some kind of salvage system in place in at least 33 states. The most recent addition is Oregon, which opted to create a salvage system in a 2017 vote, although it’s not yet operational. But based on the origin stories I’ve read and heard, these other systems do not seem to have been based on Alaska’s, and they lack its efficiency. Instead of matching every detected strike to someone who wants the meat, they mostly hope someone who hits an animal or who passes a carcass will want the meat. To wit, in the first year Washington’s take-it-if-you-see-it system was operational, 1,600 people filed notices with the state saying they’d claimed roadkill. But one insurer alone, State Farm, reported 17,612 claims for deer, elk, and moose collisions. The Alaska system is not without flaws. It can take a lot of time for dispatchers to find someone ready to haul away a moose carcass at 2 a.m. in the dead of winter, and troopers used to have to wait at the scene. Responding can be risky as well, especially if the dead moose is a calf with an angry mother around or surrounded by traffic. In 2015, the state tried to address those issues by contracting the Alaska Moose Federation, a conservation group involved in salvages. In four high-traffic areas, they were always on call to dispatch trained volunteers in specialized trucks—complete with custom winch-and-bed setups—to collect moose and deliver them to charities. They boasted a 100 percent response rate. But the program was funded with federal infrastructure money, and that same year, Congress passed a law with provisions that prevented those funds from going to the Moose Federation. So, in March 2017, the AMF had to wind down operations, and the salvage system reverted to the pre-2015 process. Alaska’s system, even with its flaws, probably isn’t replicable elsewhere. Kavalok notes that other states have too many deer strikes—in Pennsylvania, it can go over 100,000 a year—on more extensive road systems. And far fewer people are comfortable with eating, much less salvaging, roadkill. The risks associated with roadkill meat are also greater. Deer and other big game in the lower 48 states have higher disease rates, and the weather is not as reliably frigid to prevent spoilage. These circumstances make less efficient take it if you want it, but at your own risk programs the only practical option. Alaska’s roadkill salvage system is, well, uniquely Alaskan—the product of a distinct American landscape and the game folk who’ve chosen to inhabit it. Its cold weather, wilderness, and willingness slammed together decades ago to create an inventive and functional system that transforms roadkill from a state burden into a popular resource. The system may also be the product of a certain time as well as place. “People were less concerned about salvage operators’ safety and about diseased animals” when the program started, says Del Frate. “We’re a more litigious society these days,” not to mention increasingly out of touch with game meats and DIY butchery. “I’m sure it’s going to morph over the years,” he says. But just how the program changes will depend on how the landscape and people of Alaska change as well. In Inuit cultures, using the whole whale is an act of respect, including consuming its blubber and skin. 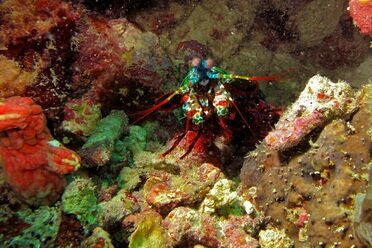 This nasal dish literally stews in its own juices.